Mobile phones are no longer what they used to be. Not only can users connect to the Internet anywhere and anytime, they can also use their devices to map their precise geographic coordinates – and access location-specific information like restaurant reviews, historical information, and locations of other people nearby. 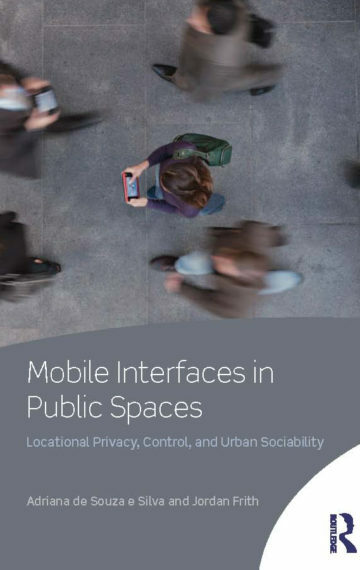 The proliferation of location-aware mobile technologies calls for a new understanding of how we define public spaces, how we deal with locational privacy, and how networks of power are developed today. In Mobile Interfaces in Public Spaces, Adriana de Souza E. Silva and Jordan Frith examine these social and spatial changes by framing the development of location-aware technology within the context of other mobile and portable technologies such as the book, the Walkman, the iPod, and the mobile phone. These technologies work as interfaces to public spaces – that is, as symbolic systems that not only filter information but also reshape communication relationships and the environment in which social interaction takes place. Yet rather than detaching people from their surroundings, the authors suggest that location-aware technologies may ultimately strengthen our connections to locations.